March | 2015 | In Domino Spera! Ps 19 R/. Lord, you have the words of eternal life. Mosaic in the Cathedral Basilica of Santa Maria Nuova di Monreale, Sicily. 12th century. Many people in our world today find this Gospel passage rather disturbing. 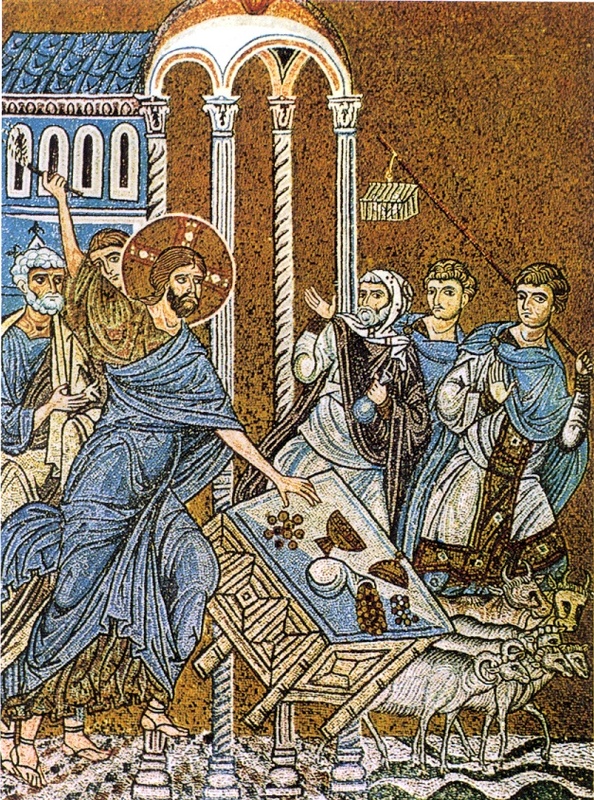 This scene of Jesus ‘getting angry’ and ‘violently’ chasing the merchants out of the Temple doesn’t sit easy with them. How can Jesus, God’s love incarnate, get angry and violent, how can these actions be compatible with love, they ask? There are two common solutions to this problem. One: simply ignore this passage, and never talk about it; pretend it’s not in the Bible, because is doesn’t fit our understanding of who Jesus is. Or, two: attribute this ‘outburst’ to Jesus’ humanity, and see it as an example of weakness just as if one of us did it. I’m sure you’re not surprised –– I hope you’re not surprised… ––, but what a bunch of nonsense! We can’t ignore a passage of Scripture because we don’t like it; if we did that, the Bible would be empty. If we think it doesn’t fit our understanding of God, then either we don’t understand God, or we don’t understand the passage. And if we think that Jesus’ humanity lead Him into an outburst of anger, a tantrum, which would be a sin, then we haven’t paid enough attention to the doctrine that Jesus was without sin (cf. Heb 4:15). So then, I guess it would seem that if we’re confused by this passage, then we just haven’t understood it… and that’s ok! There’s nothing wrong with not understanding, only with not wanting to understand. Yes, Jesus got angry, no one denies that. But John doesn’t use the word ‘anger’, he speaks of ‘zeal’ — enthusiasm in pursuit of something. Now this is important because, contrary to what many people today think, anger isn’t always sinful. Injustice, deception, falsehood, or any other form of scandal, should make us angry, because we recognise in our heart of hearts that such things are evil and that they cause us (and others) grief. The presence of sin and evil should stir in our hearts the desire to get rid of it, to fix it, to bring back goodness and proper order. That was part of the lesson of the Ten Commandments in the first reading: God’s people are called to live a life of order, one ordered to the greatest good of all, God Himself (cf. Ex 20:3-5). This anger against evil is called ‘righteous anger’, and not only is it not a sin, it’s actually a gift of the Spirit, because it’s the Holy Spirit that stirs within us this outrage in the sight of evil (cf. Neh 5:6; Ps 69:9; Ps 139:19-22). And this is what John means here by ‘zeal’: that Jesus, stirred by the Spirit, was outraged at the way the Temple was being disrespected and misused as a place of commerce and cheating. It was a violation of the sacredness of the Temple. You see, the Temple merchants were renown for cheating. Jews came from all around the known world to worship and offer sacrifice in the Temple. The merchants offered them money-changing services, but frequently ripped them off. So in chasing them out, Jesus was purging the Temple of wickedness and evil to restore its sacredness. He was chasing out sin. But notice how John also makes a point of telling us that Jesus also added a deeper meaning to His actions. John says that Jesus also spoke about the Temple of His Body (Jn 2:21). You see the Temple was a symbol of God’s presence in the midst of Israel, and Jesus is God among us. He is the true Temple. With this, Jesus and John are trying to tell us something about us. You see, because of Baptism and the gift of the Holy Spirit, we, too — you and I, and all the baptised —, have become temples of the Holy Spirit. And like the Temple of Israel, we, too, need to be properly ordered to the pure worship of God. Like the Temple, we need to be cleansed of our idols and sins. This is why the Church gives us this reading in the Lenten Season. We need to chase sin out of our lives with the same zeal and force Jesus had in cleansing the Temple. This is the role of grace! Grace and sin cannot co-exist. Either sin takes over and destroys grace, or grace purges sin. So we need to open our hearts to Jesus and ask Him to cleanse the temple of our souls; we need to ask Him to chase out our sins and idols from the depths of our hearts. And so, this passage of the Gospel is essentially an invitation to repentance and purification. This Lenten Season, may we allow Jesus to restore the sacred order in our hearts. Amen. Ps 116 R/. I will walk before the Lord, in the land of the living. In the first volume of his book Jesus of Nazareth, Pope Benedict XVI talks about how Moses would glow after his encounters with God, and that he would veil his face until it faded so as not to scare the people. The Pope continues, saying that Jesus also veiled His divine glory from the people, but when He unveils it during the Transfiguration, we notice that Jesus’ illumination isn’t reflective like Moses. Rather it comes from an interior light: Jesus isn’t radiating because He’s in the presence of God (as Moses did); Jesus is glowing from within Himself; it’s His own divine light that’s shining forth! 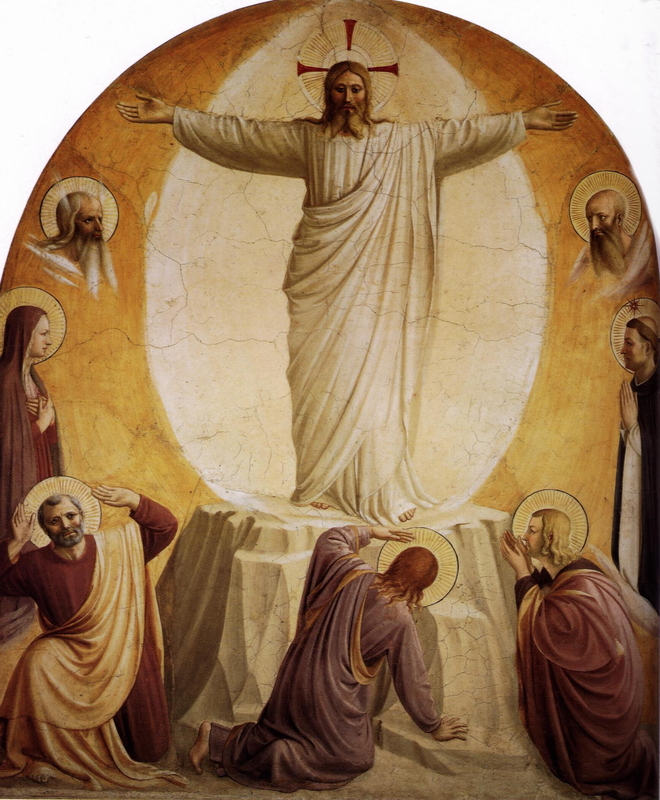 And the Transfiguration isn’t merely another encounter that Jesus has with the Father; it’s a moment when He reveals His divine glory to three Apostles, to His ‘inner circle’ — Peter, James, and John. And in case this wasn’t obvious enough for them, the revelation is supported by the presence of Moses and Elijah, and witnessed by the voice of the Father: This is my Son, the beloved… listen to Him. Jesus’ divinity is revealed in the presence of the Law and the Prophets, represented by Moses and Elijah: the Law and the Prophets testify to the divine nature of Jesus and to His messianic mission. This’ll come to light again on the road to Emmaus when the risen Jesus, beginning with Moses and all the prophets, explains to the two disciples the things about himself in all the scriptures (Lk 24:27). Now, in the Gospels of Matthew, Mark, and Luke, the Transfiguration takes place immediately after Jesus makes a prediction of His Passion and Death, and invites His disciples to follow Him by carrying their own cross. So the Transfiguration needs to be understood in connection with the Cross. In this context, Jesus’ divine glory is revealed so as to sustain the Apostles through the dark hour that’s about to come. They didn’t understand this in the moment, but it would, in due time, help them to make sense of the events. And so the Church offers us the reading of the Transfiguration on this second Sunday of Lent to remind us of Christ’s glorious and divine nature so that we too aren’t lost in the midst of darkness and suffering, but rather that we might keep our eyes fixed on the vision of Christ in His glory, our hearts fixed on the hope of the resurrection. And the Church does this to help us on our Lenten journey of prayer. Just as the three Apostles witnessed Christ’s divinity while in prayer with Him, so we, too, are invited and encouraged to pray with Christ to encounter for ourselves His divinity, allowing His glory to penetrate our being and illumine our hearts. This is at the heart of the baptismal symbols of the white garment and the candle. Through the cleansing Sacrament of Baptism, we’re freed from our sins and are made resplendent with Christ; the light of His glory now shines within us. And the Church also calls us to turn to Scripture, recognising in the witness of the Law and the Prophets — the Old Testament — the many signs that point us to Jesus as the one, true Lord. As we continue our Lenten practices of prayer, fasting and almsgiving, may we be brought closer to Jesus, to be transformed by the power of His grace and be strengthened in faith, hope, and charity. May His light, which we received at Baptism, continue to burn brightly within us, safe from the poison of sin. Amen. Ps 25 R/. Your paths, Lord, are love and faithfulness for those who keep your covenant. Every year, the season of Lent marks off a time for us to reflect on our life of discipleship and to renew and deepen our commitment to Jesus Christ. This is what is means to ‘turn back to the Lord’. And in the context of this time of renewal and conversion, the Church invites us to reflect in a particular way on our Baptism, the source of our life in Christ. That’s why the first Sunday in Lent brings us readings that speak of Baptism. The first reading today reminds us of the story of Noah and the flood, a story which speaks to us of God’s love and mercy for the righteous, and of God’s call to conversion and life. The great flood, which destroyed the disorder of evil and sin, mirrors the third day of Creation, when the waters under the sky … gathered together into one place, and … the dry land appear[ed] (Gen 1:9), making life on earth possible. In today’s section of the story, we see that after the floodwaters withdrew, God made it possible for new life to begin, life rooted in His love and in His commandments. It’s to this life that God called Noah and his family. 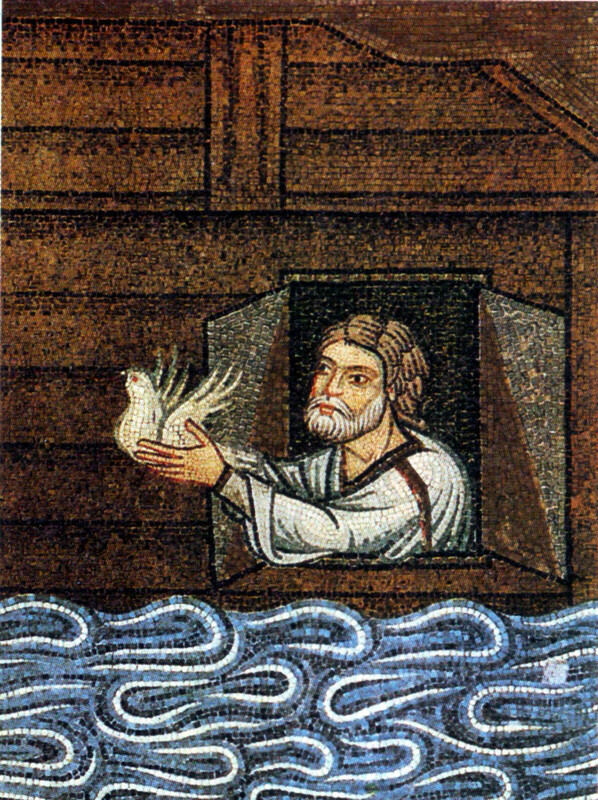 In the second reading, St. Peter explains to us how the saving of Noah and his family foreshadowed (or anticipated) Baptism, that saving water which brings us to new life in Christ. By being plunged into the waters of Baptism, our sins are put to death and our spirit is enflamed to live anew with the Spirit of God. Through the waters of Baptism, we’re united to Christ in a mystical way, bearing His Death and Resurrection in our bodies and in our souls. Rather than flesh being destroyed as it was in the flood, through Baptism, we’re elevated, given new life without destruction: a life in the Spirit. Through Baptism we’re called to live a life of righteousness, a life of humble obedience, a life of Covenant with God. God has called us out of the darkness of sin into the light of His life. But this life isn’t magic; it isn’t automatic. Life in Christ is a gift that needs to develop over time, a gift that needs to grow. As we hear in the Rite of Baptism: we must take constant care to grow in the practice of the faith we receive at Baptism, seeing to it that the divine life that God gives us is kept safe from the poison sin, to grow always stronger in our hearts (cf. no. 177). Baptism isn’t a moment; it’s the beginning of a life, a life that requires work. Baptism, or life in the Spirit, requires effort to avoid sin, to fight temptation, and to choose the Lord, everyday. Our efforts can be compared to the water a plant requires. But living out our Baptism also requires grace! Just as a plant needs more than just water in order to grow strong — it needs sunlight —, so to do we need God’s grace. And God so deeply desires to share His grace with us; that’s at the very heart of His Covenant with us. But we need to open ourselves to His grace, we need to accept it. This is where prayer comes in. Prayer is like the fertiliser that makes a plant grow stronger and faster. That’s why Jesus went out into the wilderness after His Baptism. He went out to seek God and to be closer to Him in prayer, and it’s this life of prayer that strengthened Him against temptation. My brothers and sisters, prayer does the same for us: it strengthens us against temptation by bringing us closer to God, by teaching us the ways of righteousness, by filling us with the fruits of the Spirit — joy, peace, faithfulness, self-control…—, and by making the seed of faith we received at Baptism grow into the beautiful tree that God intended it to be. Everything else that flows from our Baptism — service, evangelisation, mission, vocation, holiness… —, all of this, flows from the life of prayer that makes our Baptism alive in us. This is why every year we, too, need to join Jesus in the wilderness to renew our life of prayer, our life of faith, our life of Baptism. Because it’s in this wilderness that God teaches us His paths, instructs us in His ways, and leads us into what is right. It’s in this wilderness that prayer feeds our soul and transforms us into the image and likeness of Christ. God remembers His Covenant and remains forever faithful to it; do we? May this Lenten season be for us a time of prayer, a time of renewal, a time of unfolding the grace of our Baptism. Amen.